After a long absence (sorry!) I am finally posting another progress shot of this painting! I am still on Step Eight but I will be moving on to Step Nine shortly, very shortly! As you can see I’ve completed the cloth and background. I decided to accentuate the texture so that it compliments the fur. Both have sensory qualities that relate to touch and I thought it important that I make the cloth and fur look soft. As for the background I’ve made that less important and used my artistic license to lighten the dark by adding subtle shades of blue. This is a little difficult to see in the photo but it’s visible in person…I promise! With pet portraits it’s especially important that I use the correct colours and patterns that are found on these lovely creatures. These elements are essential. 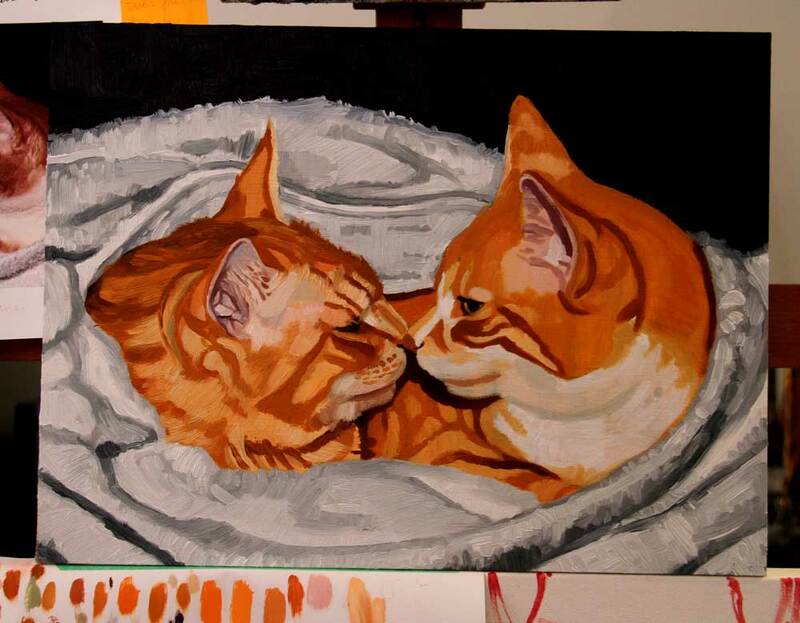 After all, a ginger cat is ginger, not gray or black or a light shade of brown! Therefore I really, truly and greatly appreciate having a variety of reference images to work from. This is terribly important as colours can vary from shot to shot. My next painting session will have me concentrating on capturing the correct patterns and colours of these boys. After that is done I can move on to Step Nine and tweak any areas that need final touches such as brightening whites and adding wispy whiskers! After which I can sign the piece and move on to Step Ten: hardware.